Manayunk Brewing, sitting where the canal meets the Schuylkill River, has been brewing up a storm and weathered quite a few storms (i.e. floods) from Mother Nature herself going all the way back to 1996. That makes it one of Philly's earliest brewpubs. It's a remarkable bout of consistency on Main Street where things can come and go as times and tastes change. And, by the way, fun factoid if you didn't know that Schuylkill translates to "hidden river" and Manayunk means "place to drink". But I'm not qualified to write about Manayunk; I haven't been there in nearly five years. Really lame on my part, eh? Consider this feature part of my atonement. The last time I was there was for a bit of al fresco dining. The deck dining at MBC in nice weather is worth the visit as much as (I'd imagine) are the brunch menu and sushi menu, the latter making it a unique brewpub visit for sure. Special events are frequent and lately, there seems to be something new always coming out of the brewhouse as they keep up with the times. Had a chance to find a taste of the Crunch at a recent festival and it's a spot-on chocolate peanut butter porter. I really must make yet more amends for not having been to MBC in a ridiculous amount of time. 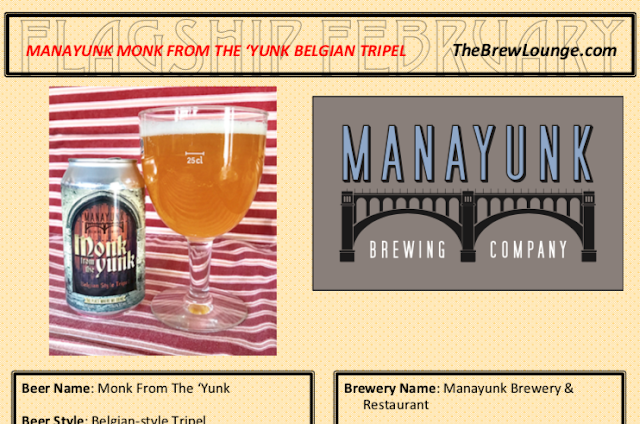 Now go click the picture below for a full feature on Manayunk's Monk From The 'Yunk. Disclosure: For this project, I solely created the list of 28 beers featured here on The Brew Lounge. I was in contact with each brewery and neither required nor requested complimentary samples. I purchased today's Manayunk beer at retail.